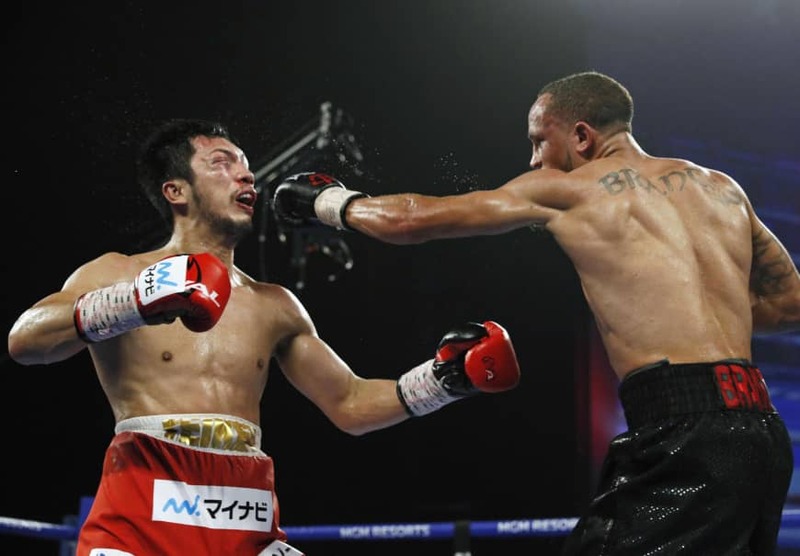 LAS VEGAS - Ryota Murata failed to defend his WBA middleweight world title on Saturday, losing to mandatory challenger Rob Brant of the United States by unanimous decision, 118-110, 119-109 and 119-109. In his second defense and first world title fight abroad, Murata took several punishing blows from Brant over 12 rounds at the Park Theater, losing to his speedier opponent who entered as the WBA’s No. 3 contender. “I thought I was going to lose,” Murata said. “He could tell when I was going to throw my right. It was a comprehensive defeat. Murata, the 2012 Olympic middleweight gold medalist, fell to a 14-2 record with 11 knockouts, while Brant now stands at 24-1 with 16 KOs. Murata made his first title defense in April, beating former European middleweight champion Emanuele Blandamura by technical knockout after eight rounds in Yokohama. He claimed the title last October after a rematch against France’s Hassan N’Dam N’Jikam, whose previous decision over Murata was called into question due to controversial scoring. In Orlando, Florida, unbeaten Puerto Rican Emmanuel Rodriguez retained his IBF bantamweight world title Saturday with a 12-round split decision over Australia’s Jason Moloney in the World Boxing Super Series. Two judges scored the bout 115-113 for Rodriguez, who improved to 19-0 with 12 knockouts. A third judge gave it to Moloney by the same score, but the Aussie fell to 17-1 with 14 knockouts. Rodriguez will next face Naoya Inoue in the Super Series tournament. Elsewhere on Saturday, Demetrius Andrade won the vacant WBO middleweight crown with a punishing 12-round unanimous decision over Namibia’s Walter Kautondokwa in Boston.